This document compares the available checklists for improving written health information for health promotion. We know bringing up hep C testing can be tricky - here's a few tips. This clinical tool clearly describes the follow-up required after a patient completes hepatitis C treatment. 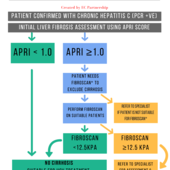 This clinical tool clearly describes how to use APRI score and FibroScan scores to assess for liver fibrosis in primary care. This catalogue was developed by the EC Partnership to facilitate increased access to hepatitis C testing and treatment health promotion materials in Victoria. While the focus is on resources developed by Victorian or national organisations to reach people who inject drugs, some resources developed for use by health providers are also included. 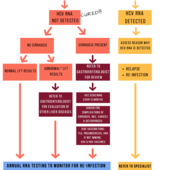 One page fact sheet about HCV re-infection.